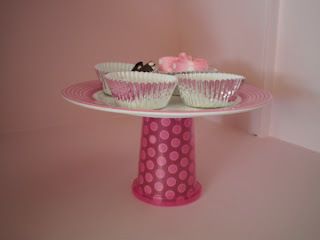 Dirt Cheap DIY: "Sippy Cupcake Stand"
Some preachers and their families get paid a lot of money. Some barely make enough to get by. While I'm actually happy that our family is the latter rather than the former, it doesn't leave much in the budget for decorating and craft supplies. So, that brings me to projects that I call "dirt cheap DIYs". It's just about using what you have, and improvising! Well, I'm decorating my daughter's room in a pink and brown "sweet shop" theme, and thought it would be so cute to organize her hair ribbons and things in little cupcake wrappers! 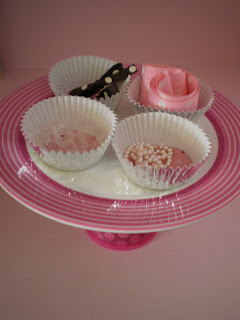 I didn't want to use my glass cake stand, in case she knocked it over, so I started trying to think of what I had that I could make one out of! Here's the lineup: scrap booking paper, muffin wrappers (I wish I'd had pink ones! ), a sippy cup, and a plastic plate I got at a thrift store for 25 cents last spring. 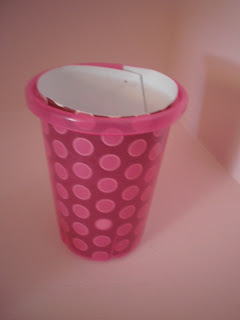 1) Cut one of your fun papers to fit inside the sippy cup. 2) Stick a big glob of sticky tack (or at least that's what I call it?) 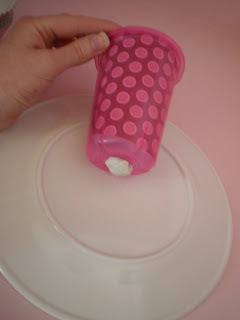 on the bottom of the cup, and press it firmly in the middle of the plate. You can also just use hot glue, but I didn't want to ruin my cup. 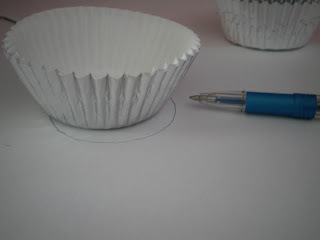 3) Trace the bottom of your cupcake wrapper onto the bottom of your other piece of pretty paper. 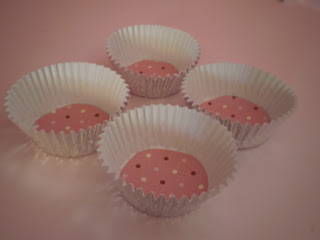 4) Glue (or tape) the circles to the bottom of the wrappers. 5) Fill the wrappers with pretty things! Now I just need to work on making her some fun hair clips to put in there! Although I love reading other blogs where everyone can buy all the latest and most expensive fabrics, I find it depresses me! We also live on a "pastor's salary" so to speak. My hubby and I have lived off support since before we got married. We never know what to expect every month! So, I love that you refashion and create on a very thrifty budget! I will be following you and look forward to being very inspired. You have GREAT ideas. 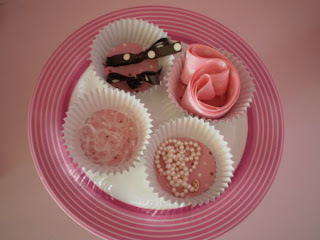 I would love to try and make some of the things you have made for your little girl, but I have a little boy! I'll have to adapt! Have a great weekend! 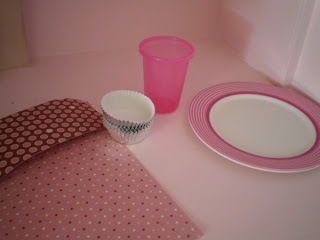 I like the addition of the cupcake cups. That would make a cute display for a craft show too! Super cute idea!!! I would have never thought of this. I love to throw parties. What a great (cheap) way to decorate the food table!!! So funny! Who would have thought of this!!! Love it! 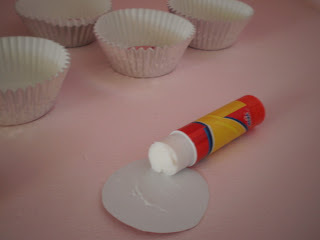 I like this idea for cupcakes or whatever your creative mind can come up with.